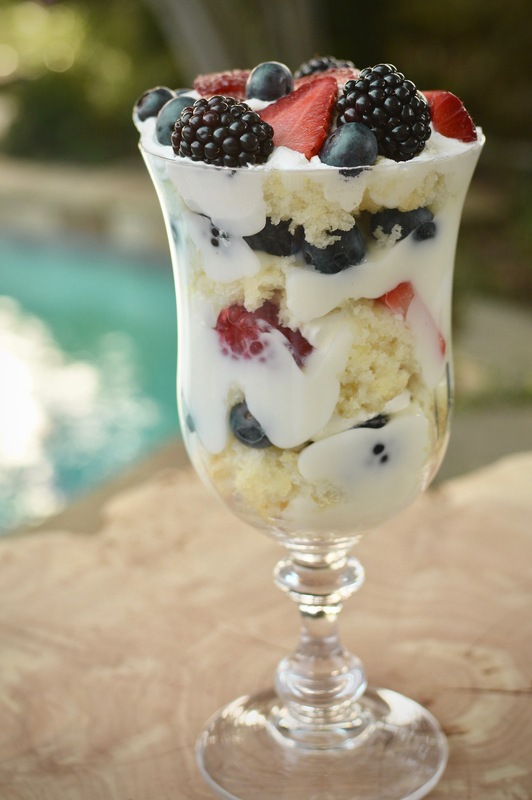 Need a fast dessert for the 4th of July holiday? 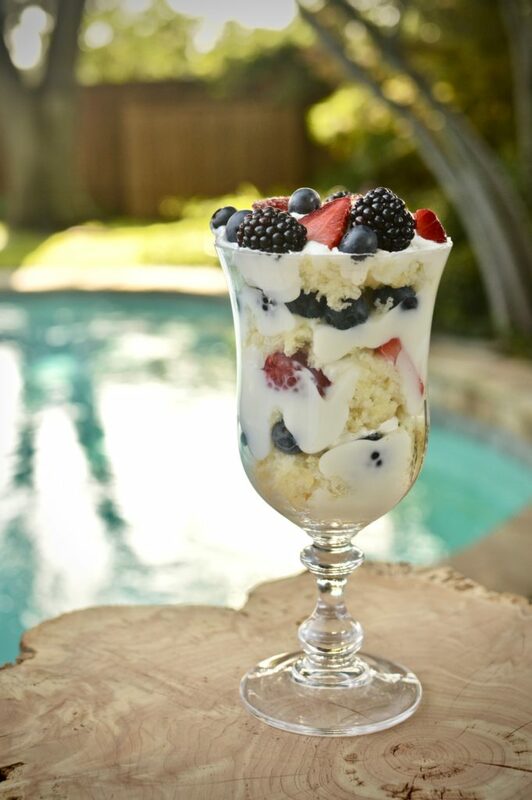 Robinsbite summer intern Courtney Quirk takes the helm today with her Trifle of the Tropics — a mixed berry trifle with pineapple angel food cake and Greek yogurt. It’s sweet, creamy and packs a protein punch that guests of all ages will love! For many, the summer season means the exciting anticipation of the annual beach vacation. But why leave the tropics at the coast? This simple and refreshing recipe will help transform your backyard into a tropical stay-cation with the help of the beloved fruit: the pineapple. This recipe was inspired by two very influential people in my life, my grandmother & my boss. My sweet grandmother loved to celebrate birthdays, and my birthday conveniently falls on the first week of summer. Every year she would make one of my favorites, an angel food cake made with an unexpected twist: pineapple! But what about my boss? 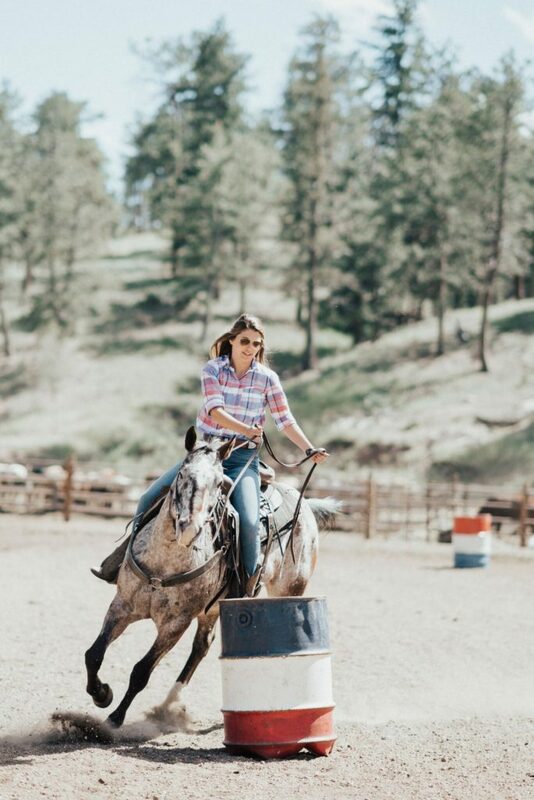 One summer I worked on a ranch in Colorado that focused on hospitality and service for the guests who visited to explore the mountains on horseback (that’s me in the pic below—-look for another post soon all about me) . At the end of the summer, my boss thanked us for our hard work by offering her own hospitality; she invited all 30 female staff members into her home with her 5 young children and served a berry and vanilla pudding trifle. The memory sticks out in my mind as such a sweet moment. Reminiscing on all of the hard work and wonderful memories that were created that summer in a lovely home with these people whom I had come to love so dearly and enjoying a delicious dessert together! 1) In a large bowl, mix together the angel food cake mix with the un-drained can of crushed pineapple. 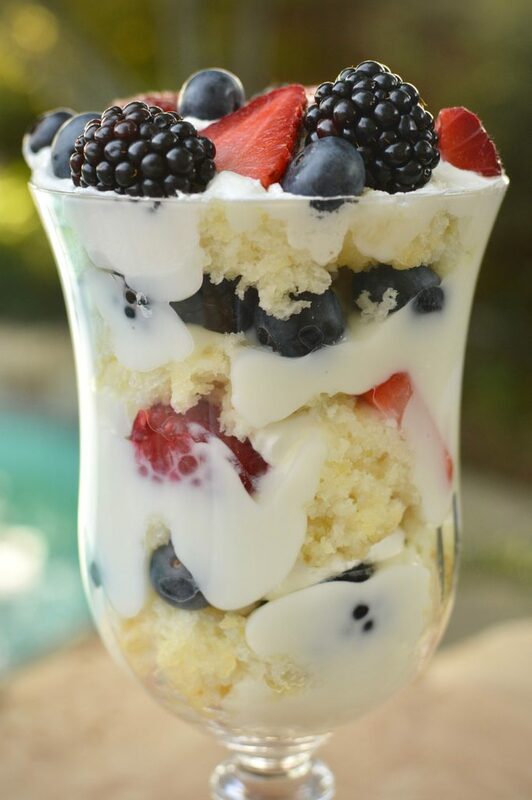 5) Repeat the layering until your trifle has reached the desired depth, adding many berries to the top layer to make a beautiful dessert! 7) Grab a spoon and enjoy! This dessert was originally inspired by this recipe. Click here for more trifle recipes.